One carnivore's journey to discover and share easy vegan recipes that you will love. Lower your cholesterol, loose weight and live a healthier life by choosing vegan meals at least 2/3 of the time. 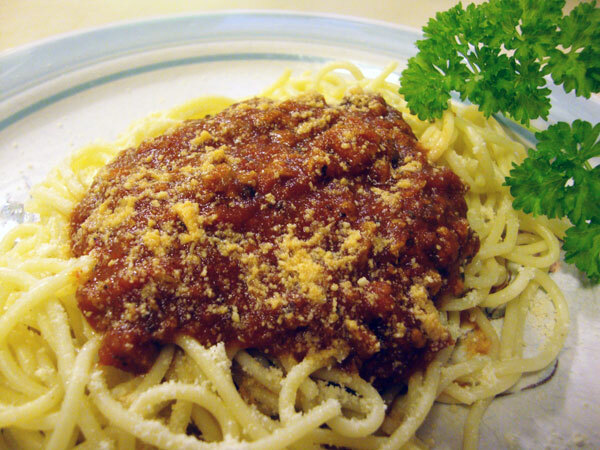 If you like spaghetti with meat sauce, you’ll love vegan spaghetti with meat sauce. This is one of the best vegan meals you can make when you are attempting to introduce vegan food to non-vegans. This recipe is also great for kids who are notoriously picky eaters. Invite some people over to your house for a spaghetti dinner. Don’t tell them you are using soy crumbles in the place of ground beef. Does anyone notice? Not only do I like this meal because it’s vegan, but also because it takes even less time to make than traditional spaghetti with meat sauce. The meat in the meat sauce is the key difference. Instead of going to the trouble of browning ground beef in a sauce pan and draining the fat before mixing in the sauce (you drain the fat, right? ), just heat up the soy crumbles right along with the spaghetti sauce. If the crumbles are frozen, add a small amount of water to the pan as they thaw to prevent sticking. Another great thing about cooking with soy crumbles or any other type of soy-based meat replacement is that you don’t have to worry about raw meat contamination in your kitchen. One of the messiest things to make in the kitchen is raw chicken. Not only does the cutting board and knife become contaminated with raw chicken juice, but the surrounding area must be sanitized and you must be very careful about washing your hands before touching any other surface in the kitchen, unless you want to sanitize that, too. Bring water to a boil, and then add spaghetti noodles, following the directions for number of servings. Add a pinch of salt to the boiling water for extra flavor. Allow noodles to boil for about eight minutes or until pasta is tender. While the noodles are going, heat up a sauce pan to medium-high. Add soy crumbles and spaghetti sauce. *Tip: If you are only cooking for two, I recommend using only half a pack of soy crumbles to one jar of spaghetti sauce. Unless you want lots of leftover sauce! Once the crumbles are warm and the sauce is lightly simmering, reduce heat to low. Sprinkle with veggie parmesan cheese and enjoy! India Stone is a freelance writer who is learning how to cook simple and easy vegan meals after a life of being a carnivore. 2012 India Stone. Awesome Inc. theme. Theme images by chuwy. Powered by Blogger.